Kogan can be bad news for a critic. Staring at my pretty much blank piece of paper after eighty minutes of beautiful violin playing � so unforced, natural sounding, so perfect a conjunction of tone and projection, so digitally immaculate � one wonders what one can add, beyond the instruction to listen immediately if one has not already done so. 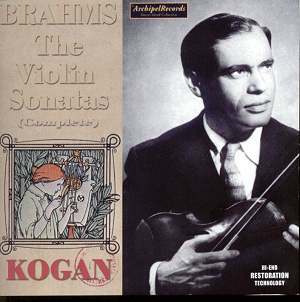 Brahms-Kogan generally spells the violin concerto. The Mytnik-accompanied sonata recordings are less often encountered though still not rare. It�s rather baffling that they didn�t record a commercial studio cycle as the Third Sonata is derived from a concert given in the Grand Hall of Moscow Conservatoire, though you won�t find that in Archipel�s customarily non-existent booklet information. You might be aware of a later Grand Hall performance of the Sonata in G, which Melodiya put out in their voluminous Kogan twofer collection in the dying days of the LP. The Kogan-Mytnik was a real duo not a chauffeur and master arrangement. Despite the fact that Mytnik is naturally not as well remembered as his illustrious partner he makes for an assertive and combative presence, all to the good for ensemble work. Their collective expressive control is always impressive, Kogan�s multi-faceted command of style and timbre proving intensely moving in the finale of the First Sonata � as it often is not. There�s a claimed date of 1955 for the First Sonata but this is surely the 1959 Melodiya/Columbia/Angel of long renown. The discs have some hiss but they seem to have been moderately well dealt with, albeit greater restorative work could have been carried out. As for the playing it remains worthy of the highest respect and the greatest possible admiration.